Sirena Huang appeared on Show 188, recorded in October 2008, at age 14. 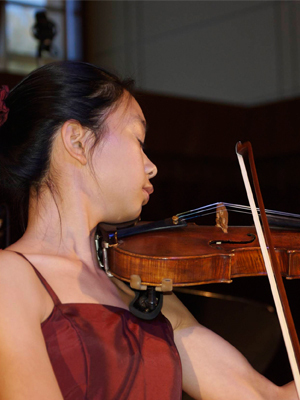 Sirena Huang (violin), 14, began violin at the age of four after seeing a video of Peter and the Wolf. Originally from South Windsor, CT, Sirena studies with Stephen Clapp at the Juilliard School Pre-College Division. She also sings in two choirs at her school. In 2006, Sirena was invited to Jordan by King Abdullah II to perform for Nobel Prize Laureates at the World Peace Conference in Petra.